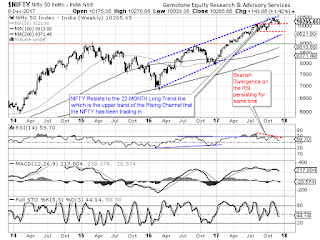 The Indian Equity Markets recovered part of its previous Week’s losses as the follow-up to the technical pullback continued and the benchmark NIFTY50 ended the Week with net gains of 143.85 points or 1.42% on Weekly basis. The gains in the Week that has gone by came much on the technical pullback that the Markets witnessed on the last two days of the Week. In the coming week, we feel that the follow-through to the pullback that happened might extend into the next coming week as well. However, in the same breadth, the Markets will find resistance going ahead and might get pushed into some consolidation as well. Some eyes will also remain on the Gujarat Polls which will have some sentimental effect as well. However, going purely on technical ground as well, Markets face resistance once again at higher levels. The coming week will see the levels of 10350 and 10490 playing out as immediate resistance levels. Markets are not expected to easily move past its previous highs that it has marked. The supports come in lower at 10130 and 9980 zones. The Relative Strength Index – RSI on the Weekly Chart is 59.6274 and it remains neutral against the prices. The Weekly MACD is bearish as it trades below its signal line. No significant formations were seen on Candles this week. The pattern analysis makes it evident that the NIFTY has taken support on the 100-DMA on the Daily Charts. However, this level also coincides with the 20-WMA on the Weekly Charts. Without any damage to the primary trend, there is still room for the Markets to consolidate. 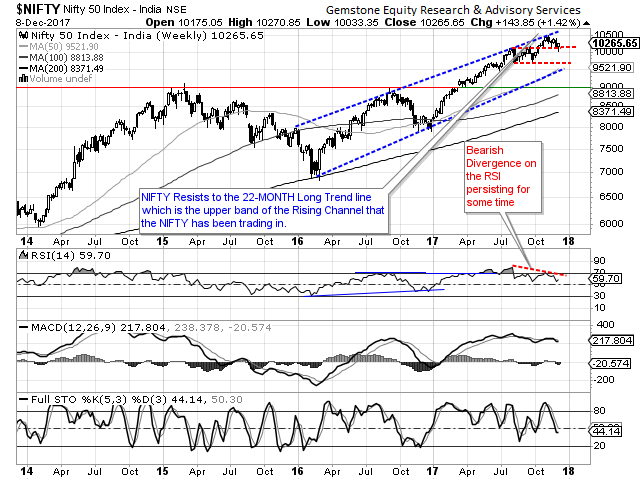 The Weekly RSI has made a lower low and it still continues in that formation capping any meaningful breakout for the Markets until this formation is breached on the upside. The coming week is likely to remain volatile as well. We expect the Markets to face resistance in the and may face itself countering some profit taking bouts from higher level once again. The Markets are likely to once again become vulnerable to weakness above 10325-10350 levels. Specific sectors are expected to stand out and picking the right stocks will be crucial as we go ahead in the coming trading week. 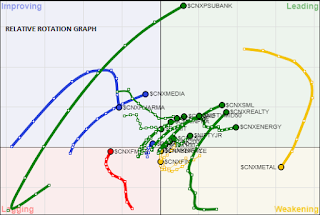 A study of Relative Rotation Graphs – RRG evidently show the coming Week will see the broader Markets relatively out-perform the NIFTY. The stocks from NIFTY JR, and MIDCAPS are likely to see out-performance. 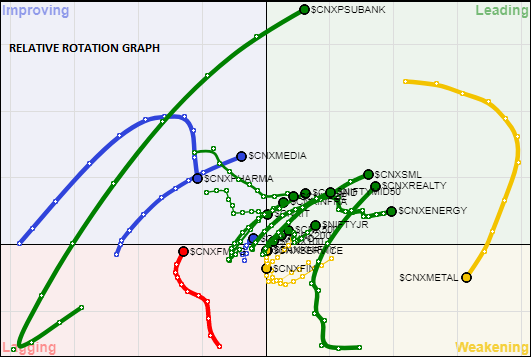 Good performance is also expected from PSUBANK Pack and ENERGY stocks accompanied by MEDIA and INFRA. No major is expected from IT Pack and it is likely to consolidate. METAL will continue to lose momentum on week-on-week basis. PHARMA too may not see any meaningful gains on a weekly note. FMCG will continue to consolidate and may attempt to strengthen its base.